If you follow me on Instagram, you might know that I have a garden. For the past two and a half months while everyone has been shoveling snow, my husband and I have been picking cherry tomatoes like it’s our job. Well, I guess its our side unofficial job–but you get the point. It all started back in late January when we both walked past our raised garden beds. We noticed a 2-foot tall rogue tomato plant. Neither of us had planted the tomato plant. It just popped up. Since we had a tomato plant in the same exact spot last summer ,we figure it must have regenerated from a few rotten tomatoes. This poor plant had been neglected for who knows how many months. We even had a plastic covering the garden beds in hopes to kill off some of the crazy weeds that had grew into our beds over the past few months. So, we started to tend to the tomato plant. Although, we weren’t religiously watering it and we definitely didn’t cover it during any of the 3 freezes we had in Florida this winter. The cherry tomato plant continued to flourish. Fast forward to present day. This plant has taken over our raised garden beds. It is over six feet tall and we have had to add a few additional supports since it spans about 10-feet wide. I kid you not when I say we pick 20-50 cherry tomatoes just about every other day. This tomato plant is made of steal although I realize that its days are coming to a close. We will probably get about another 100+ cherry tomatoes form it and then I think its done for the season. So with our influx of cherry tomatoes came this salsa. Oh, and the fact that we have 4 big bushes of fresh cilantro in our garden. I decided I would hack off one bunch of cilantro. If you garden you know that it is extremely difficult to grow cilantro. This is our first successful year from seed in almost 6 years! I’ll be the first to admit that I’m not really one for salsa made from cherry tomatoes. As I was driving home from work the other week I knew I was cooking Mexican for dinner. I wanted to make salsa and knew I only had cherry tomatoes on hand since I refuse spend money on tomatoes right now since we have so many growing organically in our own garden. We like our salsa spicy and I was trying to think of what else I could use in substitute for the traditional jalapenos. That is when it occurred to me that I had a jar of chipotles in adobo sauce in the refrigertor. This was an experiment of sorts and let me tell you that the experiment worked beautifully. The sweetness of the cherry tomatoes complimented the subtle sweet tones of the chipotle pepper in adobo sauce. My husband was head over heals in love with this Chipotle Cherry Tomato Salsa. I didn’t think he would be nor did I think I would like it but it was truly a success. He even told me that this should be my new go-to recipe. I’m not sure I would go that far, but I will tell you that when you have ingredients on hand and need to whip up a simple appetizer–make this recipe for Chipotle Cherry Tomato Salsa. In a food processor combine the cilantro, green bell pepper, shallot, garlic, and chipotle in adobo sauce. Puree for 30 seconds. Then add the 4 cups of cherry tomatoes, salt, and 1/2 lime juiced. Puree for 15 seconds until everything is well incorporated. That’s crazy Katie!! I love it! And great recipe. Aggie–I know! Seriously, the best plant we’ve ever had in our garden to date! I swear we’ve had over 500 cherry tomatoes since February! I’m such a fan of chipotle peppers in adobo!! Liz–I agree and yet I almost always forget to use them! Mmmm, love me some homemade salsa! This sounds fantastic. I wish it was tomato season up here! The bland supermarket staples are nothing compared to a good New England tomato. Ashley, I forget that while my garden is flourishing in the south that up north people are just planting seeds! I’m a little bit obsessed with chipotle, so I would totally be all over this. Yum! Ha ha I wish you lived closer! Yum! This salsa looks amazing 🙂 I love adobo! I noticed that you didn’t recommend cooking the salsa. Have you tried cooking it so that you can can it? Wondering how that affects the taste. I always make my salsa fresh and eat it within a day. I’ve never canned before so I don’t feel comfortable giving you advice. 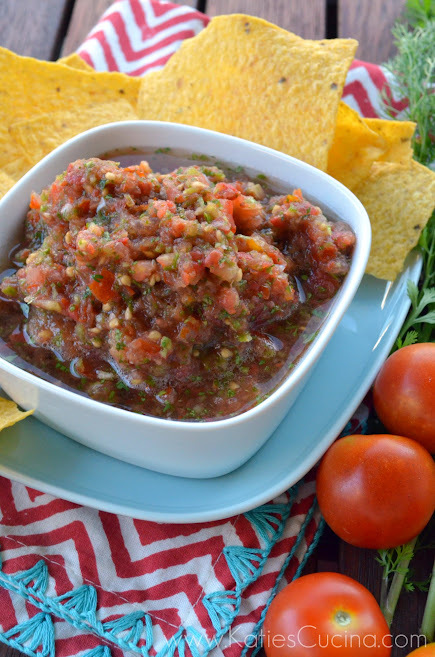 Do you have a recipe for cherry tomato salsa with jalapenos? We are getting a ton of jalapenos and cherry tomatoes in our garden this summer. Much appreciated. Love your recipes. Hi Mike, thanks for stopping by and the kind compliments. If you want to make this salsa super spicy add in a jalapeno. I created this recipe because the day I made salsa I didn’t have any jalapenos on hand. You can also check out my recipe for homemade salsa which I make all the time or make my bacon refried bean and cream cheese stuff jalapeno recipe! Great way to use up an abundance of jalapenos! Place some jalapeno peppers on the grill (that has some nice smoke going) until soft. That should be a nice alternative! Robert–great alternative if you don’t have chipotle peppers on hand! Just wondered where you bought the chipotle peppers in Adobo sauce. I looked all over and no one has heard of this. Hi Sherry, they are in a can (small like 4-6 oz) and typically in the Mexican food area of your store. I always open a can and then freeze the rest in portions since I never use a whole can in a sitting. Good luck! Thanks Nicole! I’ll have to give it a try! Katie, Thanks for posting this excellent recipe! We have made your salsa three times, all from one very productive cherry tomato plant. Our cherry tomatoes were very juicy. As a consequence, the salsa also, became inundated with acid rich tomato juice. We found that straining the salsa after removing it from the processor made the recipe more enjoyable, and palatable. I’m guessing that, the ripeness of the cherry tomatoes really affects how whether you need to strain or not? At any rate, thanks again for the wonderful recipe Katie. Hi Nate, I’m glad you enjoyed the recipe. Everyone enjoys salsa differently and I think for those who don’t like the juice your idea is right on the money! I definitely think a riper tomato produces more juice. Our cherry tomatoes are just finally ripening up here in the northwest corner of the states, but I am over run at the moment. Being a rookie at fresh salsa, and a spicy wimp, I just need to ask… How spicy are the chipotles in Adobo? My hubby likes spicy and I don’t, so I am looking for a happy medium! Would appreciate any advice! Hi Lori! Congrats on your big crop. Chipotles in adobo can be extremely spicy. The trick is to just use a tiny little bit of the sauce that they are packed in. NEVER use a full chipotle in adobo sauce… it will burn your mouth off! My advice use half the recommended chipotle in adobo sauce for the recipe and then split the batch and with the other half add in a few more spoonfuls of sauce or maybe even 1/4 chili chopped well. Good luck! Just wondering how long this would last in the fridge. I’d like to make it today, but was trying to figure it if it would last until an event in 2 days. Thanks! Hi Amy–I keep salsa in my refrigerator up to 3 days; however, know that each day it sits more liquid releases from the tomatoes!